Why Did Reality Judges Decide to Never, Ever Say Anything Critical Again? Last week’s season premiere of 30 Rock included a B-story that found Jenna moonlighting as a cruel toddler-bashing talent scout on NBC’s new hit Kidz Got Singing. Tina Fey’s show is usually spot-on when it comes to skewering reality TV, but this time it was working off an obsolete premise. The age of the brutal, ego-crushing Mean Judge has pretty much ended on prime-time musical competition series. 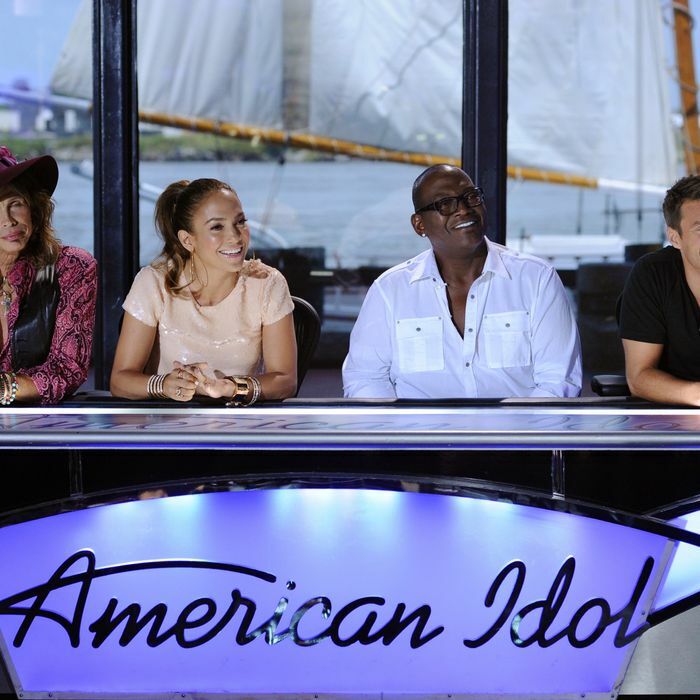 Last year American Idol welcomed a judging trio that offered nary a discouraging word to finalists once the ringers from the early rounds were dismissed. The four superstar jurists of NBC’s The Voice were too busy playfully dissing each other last spring to notice when contestants delivered subpar performances. All hopes for a break from the incessant and often undeserved wave of televisual praise fell on the reliably bitchy Simon Cowell when he returned to TV for The X Factor last fall. After all, it was his breakout brutality that spawned so many imitative reality contests and had every producer looking to fill the “Simon spot” on their judging panel with such wannabe assholes as Lorenzo Lamas (Are You Hot? ), Faye Dunaway (The Starlet), and Piers Morgan (America’s Got Talent). But no, even Simon went soft. He reserved his sharp tongue for staged banter with fellow judge L.A. Reid, while to contestants, the only sadistic thing about him was his use of the phrase “you’re the one to beat.” What has happened to singing competitions? Did the FCC institute a Douchebag Jar? Why has criticism become verboten to these on-air judges, and is boring politeness here to stay? As we near tonight’s eleventh season premiere of American Idol, we ventured to find out what’s behind this new wave of civility — and when it might end. Spoiler alert: Get your teacup pinkies out, because civility is gonna be around for a while. Given how strong ratings for Idol remained throughout last spring, audiences either disagreed with critics such as Rushfield or simply didn’t care enough to tune out. And the producers of NBC’s rival The Voice clearly noticed audiences didn’t miss the mean: It premiered in late April with a panel of celeb judges determined to kill their contestants with kindness. The very concept of the show dissuades criticism, as the judges are boosters, not critics. (And in the audition rounds, aspirants were physically blocked from even accidentally catching any wayward distaste on the coaches’ faces, thanks to the obstructing chair backs.) Exec producer Mark Burnett says that while his judges will point out when singers “who get nervous in the moment” hit a bad note, harsh comments simply don’t make sense with his show’s format. “On The Voice, there are no bad singers,” he told us. Judge Adam Levine seconds that, saying that if there were contestants who were “consistently awful,” he’d speak up. “But that’s not something we’re really dealing with because everyone on the show can sing,” he told Vulture. For the sake of argument, let’s not second-guess Levine’s talent-spotting abilities. In fact, let’s say — hypothetically! — that everyone who makes it to the later rounds on Idol, The Voice, and The X Factor are capable crooners. Even if that were true, they can’t all be equals. If they were, there would be no point in having the show; producers would just pull a name out of a hat, dub him or her the winner, and then introduce Bruno Mars playing his new single eight times in a row. Considering that the whole raison d’etre of the show is to have viewers make a value judgment and then vote, having uncritical judges be unwilling to separate the great from the good (again, being generous here) ruins the point of the show. With all three main network music shows back for new seasons in 2012, there’s hope, of course, that producers and judges will realize that there is a middle ground of offering legitimate, interesting feedback in between aping the vicious Simon Cowell of 2002 and grading everyone on a scale of A-plus to A-super-plus. After all, The Glee Project ended up drawing decent ratings in part because viewers were intrigued by Murphy’s honesty. Idol producer Nigel Lythgoe still manages to throw out zingers in his other role as judge on So You Think You Can Dance. Perhaps the judging on 2011’s music shows fell flat because so many of the players were new to their roles, or found themselves part of new configurations. The Voice mentor Christina Aguilera hinted at such a possibility and telegraphed a possible shift during a news conference for the show earlier this month: “Last year we were finding our own comfort zone. We all were tired of seeing the … ‘pick on somebody just to pick on them’ mode,” she said. “So this year we actually are diving more into critiquing.” And then of course, there’s Howard Stern, who joins America’s Got Talent this summer: One network reality insider calls Stern “the original truth-teller” and someone with the potential to redefine the honest broker role once played by Cowell. But if Stern suddenly starts telling jugglers and ventriloquists that “you’re in it to win it!” we’ll know all is lost.